.. tools & data to examine the local area employment situation .. this update on the monthly and over-the-year (Jan 2016-Jan 2017) change in the local area employment situation shows general improvement. Yet many areas continue to face challenges due to both oil prices, the energy situation and other factors. 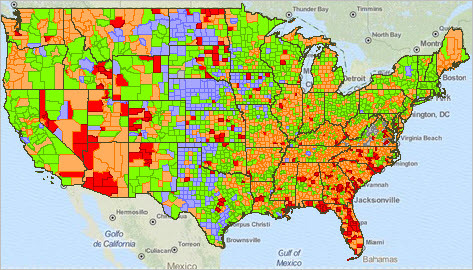 This section provides access to interactive data and GIS/mapping tools that enable viewing and analysis of the monthly labor market characteristics and trends by county and metro for the U.S. See the related Web section for more detail. The civilian labor force, employment, unemployment and unemployment rate are estimated monthly with only a two month lag between the reference date and the data access date (e.g., March 2017 data are available in May 2017). The following graphic shows the unemployment rate for each county. — click graphic for larger showing legend details. New with this post are the monthly 2016 monthly data on the labor force, employment, unemployment and unemployment rate. Use the interactive table to view/analyze these data; compare annual over the year change, January 2016 to January 2017. View Labor Market Characteristics section in the Metropolitan Area Situation & Outlook Reports, providing the same scope of data as in the table below integrated with other data. See example for the Dallas, TX MSA. The LAES data and this section are updated monthly. The LAES data, and their their extension, are part of the ProximityOne Situation & Outlook database and information system. ProximityOne extends the LAES data in several ways including monthly update projections of the employment situation. The following graphic shows an illustrative view of the interactive LAES table. In January 2017, 149 counties experienced an unemployment rate of 10% or more. The graphic shows counties experienced highest unemployment rates. Use the table to examine characteristics of counties and metros in regions of interest. Click graphic for larger view. The following graphic shows an illustrative view of the interactive LAES table focused on the Chicago MSA. By using the query tools, view characteristics of metro component counties for any metro. This view shows Chicago metro counties ranked on January 2017 unemployment rate (only 10 of the 14 metro counties shown in this view). Click graphic for larger view. The above view shows the total population (latest official estimates) as well as employment characteristics. • Population & Components of Change 2010-2016 – new March 2017. • Population Projections to 2060 2010-2060 – updated March 2017. … we are always seeking the most current data for areas of interest. This section provides an update on accessing unpublished ACS 1-year data for many counties. 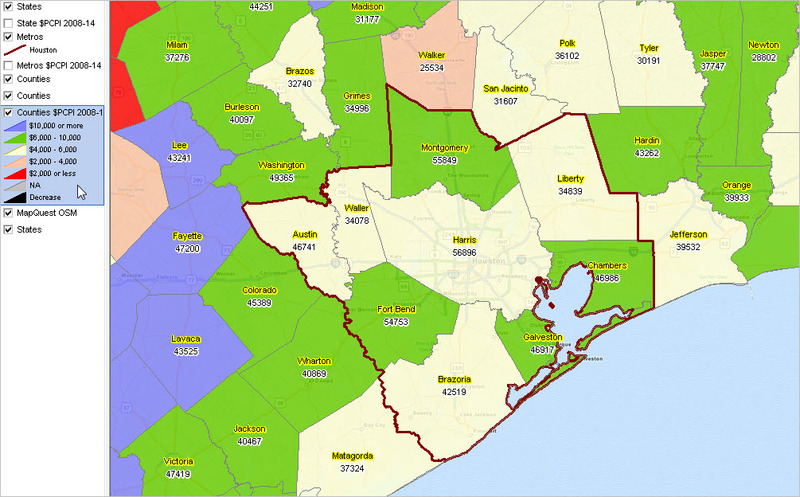 Learn about how you can access ACS 1-year estimates for 85 counties for which Census released only as 5-year estimates … and why it matters. See the corresponding full Web section. Data are tabulated from the Census Bureau American Community Survey (ACS) as 1-year estimates (for areas with population 65,000 and over) and as 5-year estimates (for areas under 65,000 population). See more about ACS 1-year versus 5-year estimates in this section. ACS 2014 1-year tabulation areas, as released by the Census Bureau included 817 of 3142 counties and 508 of 917 metros/CBSAs. There are 85 counties for which ACS 2914 1-year estimates were not released by Census but are derivable by subtracting the aggregate county components from metro totals in selected metros. 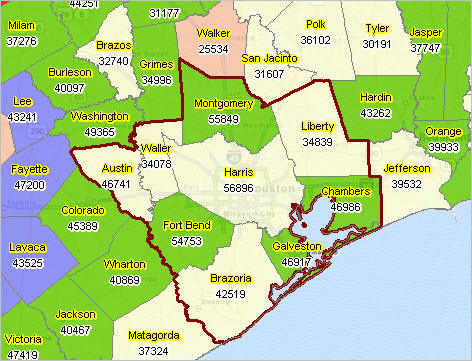 • Counties for which ACS 2014 1-year data were tabulated and released (green). 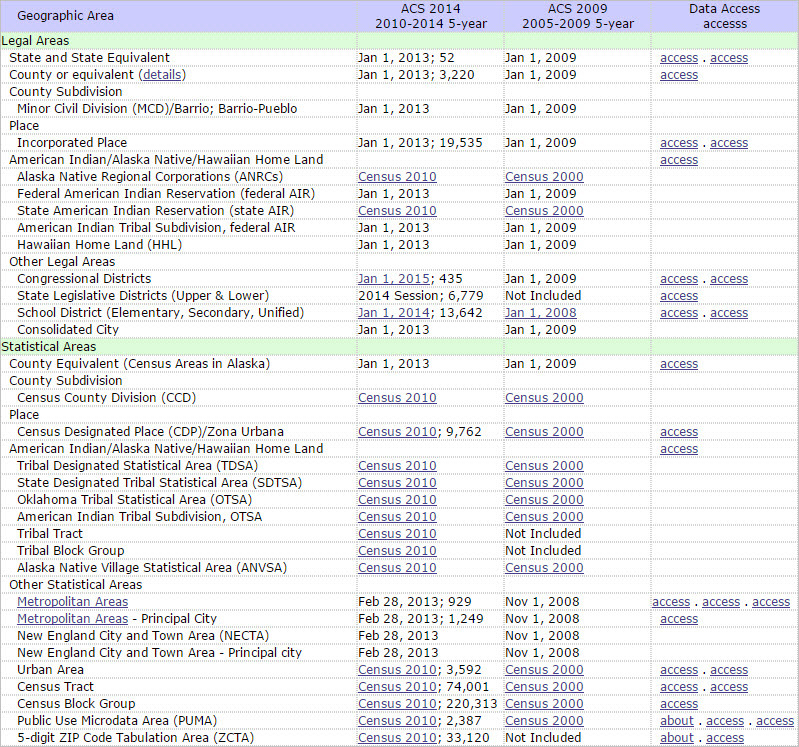 • Counties for which ACS 2014 1-year data are derivable but not released as tabulation areas (blue). The next view shows a zoom-in to the Austin, TX metro. The four green shaded counties had ACS 2014 1-year estimates tabulated and released. The fifth Austin metro county, Caldwell shaded blue, was not tabulated but the ACS 1-year data are derivable by subtracting the sum of the four counties from the metro totals. Tabulated data for Caldwell was released only as ACS 2014 5-year estimates. A similar situation exists in many metros across the country. Create CSV-like files by clicking these links. When a link is clicked a new page will show the ACS 2014 1-year estimates tabulations areas. The area name, code and ACS 2014 1-year total population estimate is shown. .. it’s about more than census tracts .. this section is about comparing American Community Survey ACS 5-year estimates: 2005-2009 with 2010-2014 … something new and powerful happening this week. To make good business decisions we need hard data, recent data, trend data … to assess patterns and change and develop reliable, superior plans. Read about the past and then how things have changed for the better. Imagine that it is 2005. Data from Census 2000 are now 5 years old. There will not be another update for richer demographics for all counties and cities in the foreseeable further. There will not be any update for small area geography such as census tracts or block groups until Census 2010. Businesses are forced to use out-of-date data to assess markets … where and how are opportunities changing? City and neighborhood planners can only make educated guesses to respond to growing needs of various population groups. Federal and state government programs that base funding allocations on demographics are challenged. Changes in the rental vacancy rates for most cities, counties and metros will remain unknown for the foreseeable future. Fast forward to 2015 and present day reality. The situation is now radically different. First, we can now compare 5-year estimates from the 2009 American Community Survey ACS to those from the 2014 ACS 5 year estimates. Second, we will be able to do that again in 2016 — compare 5-year estimates from ACS 2010 to those from ACS 2015. Health planners can now assess the size and change in special needs population and how that matches up to resources that respond to those needs — rather than guessing. Schools and school districts can better understand how school age population trending and plan for enrollment change. Education agencies are better able to assess how changing demographics among school systems compare to one-another. Businesses can now determine the size of potential markets and how they are trending based on hard data. It is possible to compare changing patterns in rental vacancy rates and rental housing market conditions for all levels of geography down to block group. The American Community Survey ACS provides a wide range of important statistics about people and housing for every community in the nation. These data are the only source of local estimates for most of the approximately 40 topics it covers for even the smallest communities. It produces statistics for ancestry, language, education, commuting, employment, mortgage status and rent, as well as income, poverty and health insurance. The ACS estimates are tabulated annually as 1-year estimates (e.g., the ACS 2014 1-year estimates) and 5-year estimates (e.g., the ACS 2014 5-year estimates. See a comparison below in this section about scope, advantages/disadvantages, and other usage attributes for the 1-year versus 5-year estimates. See ACS 2014 5-year main page for additional data access & use details. Data from the 5-year estimates are available for all geographies down to the block group level regardless of population size. Starting with the ACS 2014 5-year estimates, for the first time, users will be able to compare two non-overlapping five-year periods 2005-09 and 2010-14. Looking ahead, data from the 2006-10 and 2011-15 (available December 2016) will be comparable … and so on. Over several years, a time-series of 5-year estimates, non-overlapping five-year periods, will evolve. The following graphic summarizes geographic tabulation areas for 2005-09 and 2010-14 ACS 5-year data. Use the corresponding Web table as a reference guide for comparing data over time. Links provided in the table enable you to navigate to selected data access tables. This Web-page table updates with new links; bookmark the page for re-visits. Posts later this month will provide updates on this topics; new data and new data analytics tools. Join me in a Data Analytics Lab session to discuss use of these data using analytical tools and methods applied to your situation.